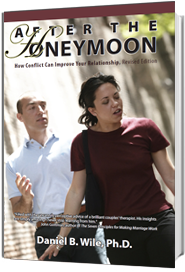 Doubling, speaking as one partner talking to the other, is the premier way to accomplish the principal task of Collaborative Couple Therapy, which is to turn arguments into conversations and disengagement into engagement. When I first began to double, before I had sufficient experience to develop mental guidelines for doing so, I simply asked myself, “How can I replace this partner’s angry, inflammatory comment with a less provocative one or this disengaged impersonal comment with a more intimate one?” And I’d stumble along the best I could. As the years went by, I found myself adopting certain principles to help me make my translations. This is the first of three blog entries in which I lay out these principles. I’ve come up with 6 principles. Here are principles 1 and 2. Tone is expressed also in non-verbal ways, in facial expression and body language. When doubling for angry partners, I replace their harsh tone with a gentle one. I talk in a friendly way so their partner can hear. When doubling for withdrawn partners, I replace their distant tone with an engaged one. Principle 2: Add Vulnerable Feelings. Recast Complaints as Wishes, Fears, or other Soft Feelings. A good way to turn a withdrawn or adversarial exchange into an intimate one is to introduce vulnerable feelings. When partners withdraw, they are, of course, not confiding vulnerable feelings, expressing what’s on their mind, or reaching out intimately When I double for them, I do the confiding, expressing, and reaching out for them. I hope Gary will appreciate the comment I made for him and, seeing its effect on Ramona, become a little more likely in the future to make such comments for himself. When people withdraw, we know they lose contact with their partners. When people attack, they lose contact with themselves or, more exactly, with the vulnerable feelings that led to their anger. When I double for them, I try to work back to these feelings. Dan (doubling for Eileen talking to Oscar): As you can see, I’m furious, but beneath that somewhere I feel hurt. Eileen (suddenly reconnecting with her softer feelings): Quite a lot of hurt. Any number of vulnerable feelings may lie at the root of a partner’s anger: disappointment, longing, fear, shame, and so on. When I have an idea what the particular vulnerable feeling might be, I put it in words, as I did when speaking for Eileen, I suggested she felt hurt. But couldn’t Maggie be experiencing other feelings—loneliness, for example, rejection, insecurity, hurt, or hopelessness? She might. As soon as I get a sense of what this other feeling might be, I bring it out. In the meantime, I look for a wish or fear. Whatever else Maggie might feel, she still wishes Steve would text her and/or fears what it means that he doesn’t. Wishes and fears are omnipresent because they are the other side of complaints. As Marshall Rosenberg put it, “All attack, blame, and criticism is the tragic expression of unmet needs“—which, to my way of thinking, means unfulfilled wishes and unrelieved fears. Locating the underlying wish or fear is a quick way to turn a “you” statement into an “I” statement. Angela says to Mitch, “It would be nice if for once you’d manage to come home in time for dinner.” In my search for the wish or fear, I flash through the following possibilities. Is deeply into her anger and has neither desire nor ability at the moment to reconnect with the vulnerable feelings that led to it. Feels humiliated at the thought of having such vulnerable feelings or uncomfortable at the idea of acknowledging them. She would feel too exposed. Needs her husband Mitch to understand how she feels. My doing so is an inadequate substitute. My message when I double for partners is essentially: I offer this idea about what you might feel as a speculation to stimulate your thinking about the matter. Please use my speculation as raw material out of which to fashion a more accurate statement of your own. Think of my statement as a first approximation to build upon, reshape, modify, or reject entirely and replace with something quite different. When I have a sense of what the partner’s particular vulnerable feeling might be, I express it. When I don’t have a sense, I have a fallback plan. I look for a wish or fear. This fallback measure gives me a way to proceed when I don’t know the nature of the underlying vulnerable feeling, or even if there is one. I’ve been trying ego state/parts therapy with my couples in which I encourage them to do Imaginative Nurturing with each other. I encourage the adult in one lover to imaginatively visit the much younger, often terrified part in the other triggered by a conflict in the present and try to persuade the younger part to join me and the adult lover, all three of us in the same room together. I then slowly, gently attempt to soothe and reassure the younger part, modeling the soothing and reassurance for the adult lover whom I then encourage to do it in place of me. If the younger, terrified parts are triggered in both lovers at the same time, I try imaginatively nurturing each part in what is always a very stressful balancing act, once described by Sue Johnson as like standing in the middle of a highway trying to keep from getting run over by two trucks! I’m also thinking of using the EMDR protocol followed by Imaginative Nurturing after the clear body scan in couples therapy sessions in addition to individual therapy sessions . I’ve been deeply influenced by the work of April Steele (Imaginal Nurturing, Ego States and Attachment: An Integrated Approach to Early Deficits); Jim Knipe (The EMDR Tookbox), Roy Kiessling (EMDR Training) and Robin Shapiro (EMDR Solutions and Easy Ego State Interventions: Strategies in Working with Parts). I’d love to know yours and Dorothy Kaufmann’s thoughts as well as those of other couples therapists about doing more neuroscience based work with couples. Please feel free to share my email address. Many thanks. Insightful, as usual. I will attempt to identify my “wish or fear” the next time I have a complaint regarding my spouse or kids! A very good exercise. Another great blog. I love reading what you say! What I think you do is to link what I see as so centrally psychodynamic (the explication of wishes and fears) as in my book, with your idea of being a better spokesperson for your clients. I think you summarize this quite well with the title of this piece: Recasting complaints as wishes and fears. This, I believe, is a major contribution and one I keep mentioning to others whenever I get a chance. 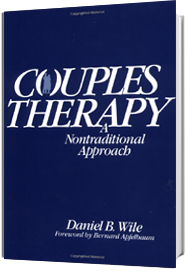 Hope you are well and happy and continuing to get the word out about the benefits of couple therapy and esp. your way of doing it. Very brilliant, as usual Dan! Thanks for helping us stay awake and perceptive while working with couples! Thank you, Dan, for this beautifully written description and explanation of how and what you do with couples. I love the idea of casting complaints as wishes and fears. Also, it’s helpful that you identified the Susan Johnson and John and Julie Gottman viewpoints related to the unexpressed longings, unmet needs, etc. Dan, great work and clear, compelling examples of how to turn a complaint/criticism into a desire or fear. 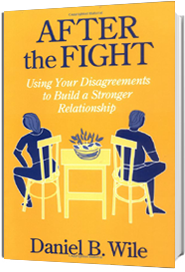 I’ll often add a brief piece that resonates with the anger or frustration behind the complaint while inviting a person into understanding the hinge (either turning against or towards the other spouse) and choosing a movement towards. Something like, “You know, it’s easier for me criticize you…like, ‘You always go silent when I most need you.’ But really I long to find a way for us to come together when I’m spiraling in fear and suspicion.” The “It’s always easier/tempting for me to criticize you” is such an attractive and indirect way to challenge the spouse I’m speaking as while calling him/her to growth in humility and courage. Thoughts?